ESO’s VISTA survey telescope has spied a horde of previously hidden massive galaxies that existed when the Universe was in its infancy. By discovering and studying more of these galaxies than ever before, astronomers have, for the first time, found out exactly when such monster galaxies first appeared. Just counting the number of galaxies in a patch of sky provides a way to test astronomers’ theories of galaxy formation and evolution. However, such a simple task becomes increasingly hard as astronomers attempt to count the more distant and fainter galaxies. It is further complicated by the fact that the brightest and easiest galaxies to observe — the most massive galaxies in the Universe — are rarer the further astronomers peer into the Universe’s past, whilst the more numerous less bright galaxies are even more difficult to find. 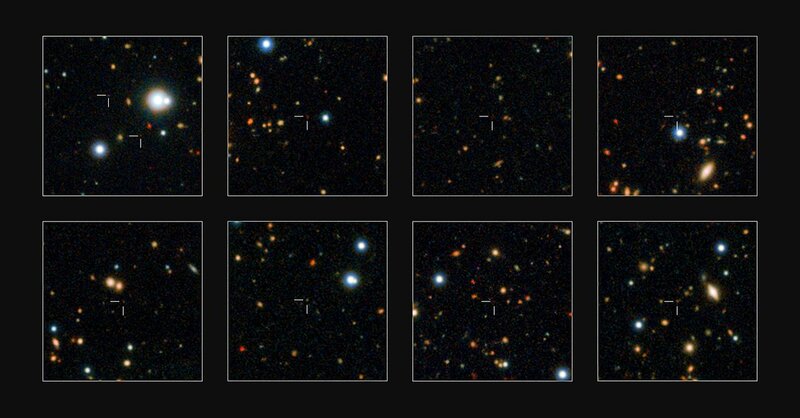 A team of astronomers, led by Karina Caputi of the Kapteyn Astronomical Institute at the University of Groningen, has now unearthed many distant galaxies that had escaped earlier scrutiny. 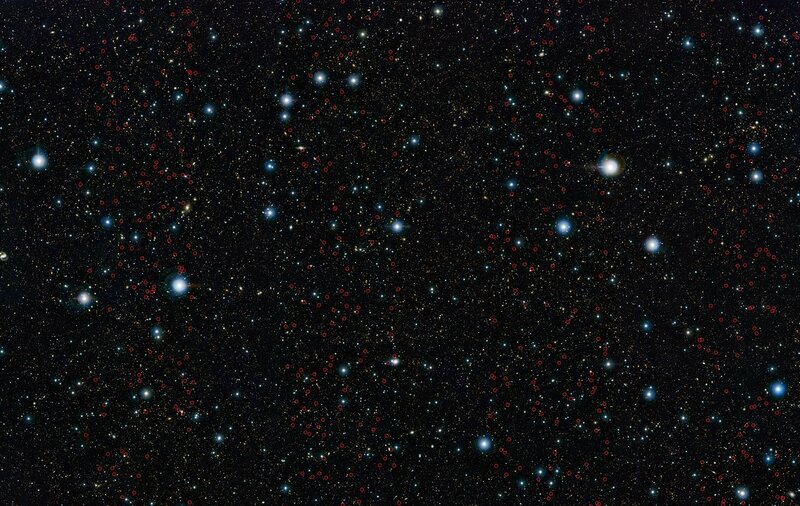 They used images from the UltraVISTA survey, one of six projects using VISTA to survey the sky at near-infrared wavelengths, and made a census of faint galaxies when the age of the Universe was between just 0.75 and 2.1 billion years old. UltraVISTA has been imaging the same patch of sky, nearly four times the size of a full Moon, since December 2009. This is the largest patch of sky ever imaged to these depths at infrared wavelengths. The team combined these UltraVISTA observations with those from the NASA Spitzer Space Telescope, which probes the cosmos at even longer, mid-infrared wavelengths . Imaging the cosmos at near-infrared wavelengths allowed the astronomers to see objects that are both obscured by dust, and extremely distant , created when the Universe was just an infant. The team discovered an explosion in the numbers of these galaxies in a very short amount of time. A large fraction of the massive galaxies  we now see around us in the nearby Universe were already formed just three billion years after the Big Bang. “We found no evidence of these massive galaxies earlier than around one billion years after the Big Bang, so we’re confident that this is when the first massive galaxies must have formed,” concludes Henry Joy McCracken, a co-author on the paper . In addition, the astronomers found that massive galaxies were more plentiful than had been thought. Galaxies that were previously hidden make up half of the total number of massive galaxies present when the Universe was between 1.1 and 1.5 billion years old . These new results, however, contradict current models of how galaxies evolved in the early Universe, which do not predict any monster galaxies at these early times. To complicate things further, if massive galaxies are unexpectedly dustier in the early Universe than astronomers predict then even UltraVISTA wouldn’t be able to detect them. If this is indeed the case, the currently-held picture of how galaxies formed in the early Universe may also require a complete overhaul. The Atacama Large Millimeter/submillimeter Array (ALMA) will also search for these game-changing dusty galaxies. If they are found they will also serve as targets for ESO’s 39-metre European Extremely Large Telescope (E-ELT), which will enable detailed observations of some of the first ever galaxies. ESO’s VISTA telescope observed in the near-infrared wavelength range 0.88–2.15 μm while Spitzer performed observations in the mid-infrared at 3.6 and 4.5 μm. The expansion of space means that the more distant a galaxy is, the faster it appears to be speeding away from an observer on Earth. This stretching causes the light from these distant objects to be shifted into redder parts of the spectrum, meaning that observations in the near-to-mid infrared are necessary to capture the light from these galaxies. In this context, "massive" means more than 50 billion times the mass of the Sun. The total mass of the stars in the Milky Way is also close to this figure. The team found no evidence of massive galaxies beyond a redshift of 6, equivalent to times less than 0.9 billion years after the Big Bang. This is equivalent to redshifts between z=5 and z=4. This research was presented in a paper entitled “Spitzer Bright, UltraVISTA Faint Sources in COSMOS: The Contribution to the Overall Population of Massive Galaxies at z = 3-7”, by K. Caputi et al., which appeared in the Astrophysical Journal. The team is composed of Karina I. Caputi (Kapteyn Astronomical Institute, University of Groningen, Netherlands), Olivier Ilbert (Laboratoire d'Astrophysique de Marseille, Aix-Marseille University, France), Clotilde Laigle (Institut d'Astrophysique de Paris, France), Henry J. McCracken (Institut d'Astrophysique de Paris, France), Olivier Le Fèvre (Laboratoire d'Astrophysique de Marseille, Aix-Marseille University, France), Johan Fynbo (Dark Cosmology Centre, Niels Bohr Institute, Copenhagen, Denmark), Bo Milvang-Jensen (Dark Cosmology Centre), Peter Capak (NASA/JPL Spitzer Science Centre, California Institute of Technology, Pasadena, California, USA), Mara Salvato (Max-Planck Institute for Extragalactic Physics, Garching, Germany) and Yoshiaki Taniguchi (Research Center for Space and Cosmic Evolution, Ehime University, Japan).